We have decided to publish design white papers for all of you that want more information on the grinder or just general information to think about while making your decision on which grinder to purchase. Checkout our first white paper titled “Design for Vibration”. You asked and we listened! We are excited to announce the release of our new surface grinding attachment! This idea has been in development for quite awhile. I wanted to bring something new and exciting to the market that didn’t necessarily follow what was already out there. We considered may different ideas from a stand-alone unit to an integrated stand with a surface grinder build in. We settled on developing an attachment. Once we decided on the attachment style unit we worked hard to develop a great unit that was innovative while keeping the cost manageable. What we developed is an amazing attachment with a bearing-less slide, magnets that can be switch on/off without power, 15” surface, tilting surface, and a easy to use digital counter. We are happy to open up preordering at a great deal! The image below is of our prototype unit. We will be starting our production parts soon and shipping the first units in late March. We are posting new videos to our YouTube channel over the next few days of our new 2x72 belt grinder design and our other product offerings. Help support us by entering our progressive raffle! Click here for more information. We are currently sold out of our 2x72" belt grinders! We want to take a week or two to review the design, our suppliers, marketing strategy, and input from you to refine, control cost, and provide more add-ons. Look for an announcement with the next week or two about our generation 3 design with pre-order opening up by the end of May. As always please let us know if you have any questions or comments! New announcements and lots of exciting things! First off all our products are available thru USAknifemaker.com. This partnership has been a couple months in the making but we are excited to partner with them. We have had an increase in sales and our product is being used across multiple industries! We have our grinders in custom motorcycle fabrication shops, general fabrication shops, as well as, being used for custom knife making. Check out our instagram page for more photos and videos of a complete Black Fox Knife Works ONE 2x72" grinder build. We have received notice from our motor manufacture that prices will be increasing 5% and from our fabricator that steel and aluminium prices are rising. Even though price are increasing we are locked into our current pricing until we run out of stock. Get your orders in while you can to take advantage of the current pricing. Over the next few months we will be taking a hard look at our design, fabrication, and vendors to brainstorm solutions to keep pricing the same for next year. 2x72 grinder in augmented reality using the Augmented App. Check out our 2x72 belt grinder design using the free Augment app! You can view the design in 3D in real time and space thru your phone. Create a target to place the grinder anywhere to get an idea of the space required. Check out the video below of more information. Check out our 2x72 Black Fox ONE belt grinder in the Augmented app. You can view the grinder design in real time and space using your phone. More info on the grinder at Blackfoxknifeworks.com. 2017 was an exciting and fun year for us. From design to production to startup we have been busy at work getting ready to enter the market. We had several pre-order customers that supported us and we are excited to announce that those grinders and kits were shipped or delivered in the last week of 2017. All the major components were made in America and the fabrication was sourced from local companies in the Pacific Northwest. We spent the 1st day of 2018 assembling and testing our test grinder and we have very pleased with the results. It has been a long road to get here but we are looking forward to what 2018 brings. We have some big announcements coming in 2018. To keep upto date on all our announcements signup for our newsletter at the bottom of this page. Quick demo of the Black Fox ONE 2x72 belt grinder. Profiling a kitchen knife. Testing out the small wheel attachment from Knifegrinderparts.com on the Black Fox ONE 2x72 belt grinder | Knife Grinder. Profiling is a breezy with the option of a 2" or 5" contact wheel and a flat platen all in the same place. Check out that beefy work rest. All this is includes with the complete Black Fox ONE. Back to 2017 and the start of production. Laser cut parts waiting to be welded. Several tracking arms in progress. Post weld cleanup on the base weldment. These guys really know how to lay down some nice welds. Grinder assembly in process. Middle grinder has the knifegrinderparts.com platen. Highly recommended if you are looking for a standard flat platen. Black Fox Kit being inspected and packaged for a pre-order customer. The first design iteration was subjected to stringent finite element analysis (FEA) and computer modeling. Shows the displacement of the same loads applied as the stress model. Even though the results of the FEA testing showed that the grinder had low stress and deflection it was found thru a quick poll of peers that the grinder looked not as robust as it should. With this feedback in hand we upsized the sheet metal material thickness to increase the robust look of the grinder. The first prototype of the grinder was built in August of 2017. After some testing we decided that to take the design to the next level it had to be reviewed by a Master bladesmith. Luckily Bruce Bump lives in the same town. I contact Bruce to see if he was interested in taking a look at my prototype and providing feedback. Thankfully he was open to the idea and willing to take some time to review it. I trucked my prototype design over to Bruce's house where he and his apprentice picked apart my design have gave me some wonderful suggestions to bring the design up to another level. With Bruce's feedback in hand as well as the details I knew needed to be addressed I spent another 2 months tweaking the design. The final design pushes the limits of what a great knife grinder should be and sets the benchmark high for future grinders. 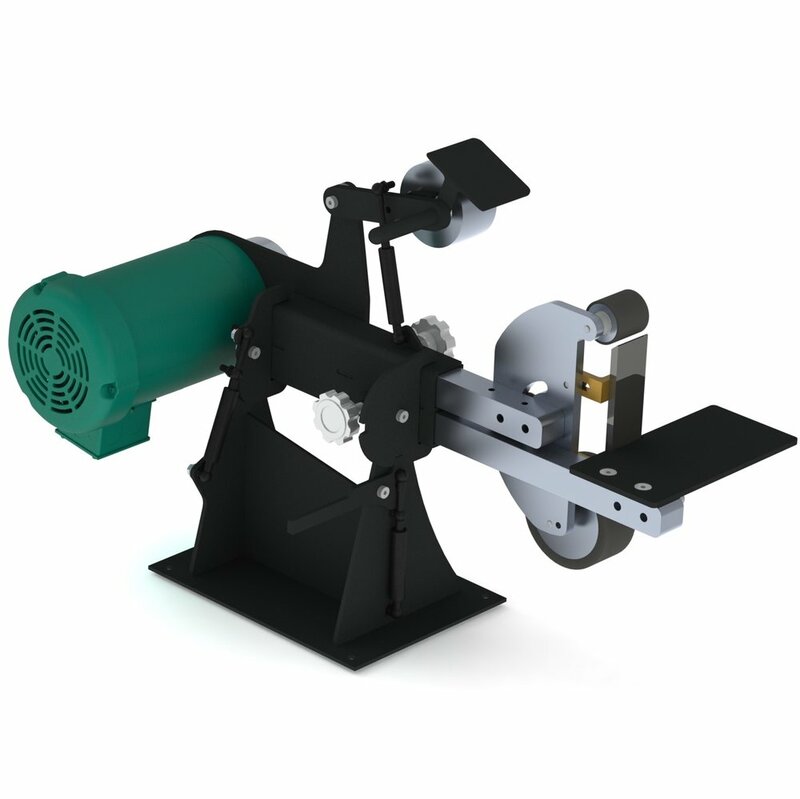 Not only do we believe that this 2x72" belt grinder will do well in the knife making industry it will do well in woodworking, fabrication, and any application where precision material removal is needed. We have received great feedback on the design and look forward to seeing what 2018 holds for us. The first production run will be ready to ship the last week of December 2017 with a second batch of 5 that will be ready mid to late January.